Wearing the Bonobos Italian Performance Suit in navy pindot. 38R slim blazer fit. 31-inch waist slim fit pants. Two button. Notch lapel. Flap pockets. Double vent. Simple and classic business styling. when I brought it to my tailor, he asked me two questions. First, where did you have this made? And second, did you already have the jacket and pants tailored? If you’re looking for a suit with those attributes and need a quick turnaround, I can definitely say that you should give Bonobos a try. I have been curious about Bonobos, especially their suits, for quite some time. Our previous Managing Editor, Adam Stone, who is now quite an accomplished stylist, moved from Chicago to NYC to work with the brand. Needless to say, I respect Adam very much and knew he wouldn’t work with a company he didn’t believe in. Fast forward a couple two, three years, and I’m here with an opportunity to test drive the Bonobos experience. What follows will be a review of Bonobos suits, focusing on fit, fabric, and quality. Full transparency, this post is presented in partnership with Bonobos (as indicated clearly and conspicuously at the top of the post–it’s a shame some people don’t ever disclose their relationships with brands, isn’t it? Shame on them. ), but I was fully prepared to say, “thanks, but no thanks” if the garments were subpar. Moving on into the review. A quick elevator speech about Bonobos. Bonobos was founded in 2007 as a brand dedicated to making pants that actually fit well. Since then, they’ve expanded into men’s shirts, suits (including formalwear), and more. Everything is done online. There are 60+ brick and mortar locations, but the brand considers them “guideshops”. Basically, a real-life virtual showroom. Find the fit you like and they ship it right to your door. Free shipping both ways. And a generous return policy. 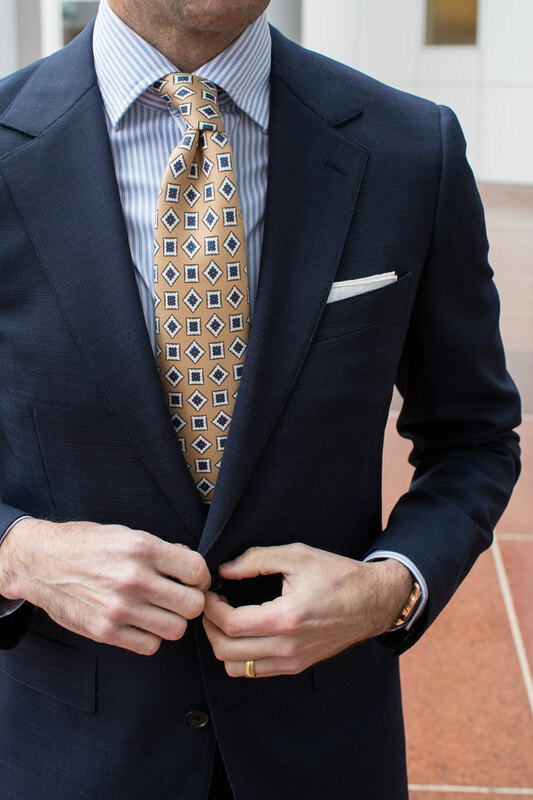 The suit I’m wearing: The Italian Performance Suit in navy pindot. 38R slim blazer fit. 31-inch waist slim fit pants. Two button. Notch lapel. Flap pockets. Double vent. I took a complete gamble with the sizing. In the past, with other brands, I have been in the habit of choosing a 36R jacket and a 30-inch waist on my pants. I should mention that in the past, I was okay with my suits being slightly on the more fitted side. However, as I’ve gotten older and more mature in my approach to classic men’s style, I have deliberately chosen to go with garments with slightly more room–both for comfort and looks. So did my gamble pay off? How does the suit fit? Surprisingly well. I mean, I was very impressed. In fact, when I brought it to my tailor, he asked me two questions. First, where did you have this made? And second, did you already have the jacket and pants tailored? It was that good. As you can see. Well, then, why was I at the tailor? The pants come unfinished, which is a great move on their part, as it allows the purchaser to dial in that very important detail to their exact specifications. It would be nice if Bonobos would cover the cost of alterations, but this is not something they currently offer. The fabric. The fabric is a four-way stretch Italian wool from Marzotto (97% wool, 3% elastane). It’s navy with a lighter blue pindot, which gives it some nice depth and texture. I should note that my tailor also commented on the fabric, which he said he knew and was familiar with as a solid workhorse fabric. The addition of the elastane gives it a bit of stretchiness, which adds to the overall comfort and flexibility. One more thing to point out is that the fabric is both stain and liquid repellent. Rob and I shot these photos during a light rain. If you look closely, you might be able to see some small water beads on the jacket. Incredibly, when you push them away, they roll right off and do not leave a mark. The details. One of the reasons I generally go made-to-measure or bespoke is because of the control over important details, especially when it comes to jacket lapels. Most OTR options tend to have fairly narrow lapels, which are a complete no-go for me. However, the lapel width on this suit is exactly what I ask for with the majority of my MTM or bespoke suits–3.5 inches. I also am very picky when it comes to the leg opening of my trousers. I am typically in the 13.5-14″ range. And these trousers–slim fit–come it at 14″. I had my tailor hem them with just a slight break. One unexpected, interesting, and mildly strange detail to point out is the existence of an extra zipped pocket in both the pants and the jacket. In the pants, it is directly behind the front pocket. On the jacket, it is on the inside. I have never seen this feature before. I could imagine it being used to its best advantage for cash or a card that you definitely don’t want to slip out of another pocket. However, I would avoid using it for anything bulky. The verdict. Though my experience in the RTW suit department is admittedly limited, I have to say that I was pleasantly surprised and impressed with Bonobos. The fit is excellent. The styling is classic. The fabric is a nice quality and quite comfortble, with the added bonus of it being a liquid repellant performance fabric. If you’re looking for a suit with those attributes and need a quick turnaround, I can definitely say that you should give Bonobos a try. Chime in: What are your thoughts on Bonobos? I have a Bonobos store nearby. I like the guideshop experience. The suits have a variety of styles that fit well trendwise without being too trendy. They also have chinos I love and seasonal choices for shirts and such. I have a few Bonobos chinos and they are great! Love the fit and fabric. I can’t stand Walmart, their horrible business practices and the Koch Brothers in general – and on principle…and refuse to shop those stores. So this is where I respectfully and completely disagree w/ Brian on this particular vendor. Walmart owns Bonobos. I don’t care so much that the suit was made of a good cloth, or it fit well. BENTONVILLE, Ark., and NEW YORK (June 16, 2017) — Walmart today announced it has entered an agreement to acquire Bonobos, Inc. (“Bonobos”), one of the leading apparel brands built on the internet, for $310 million in cash.